Reverie produce carbon fibre rear diffusers designed to allow fitment to any vehicle. 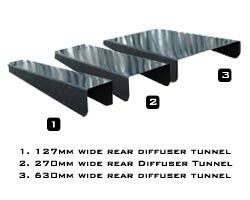 Our range of diffuser elements can be bonded to fourm a larger diffuser. Like all of our products our rear diffusers are autoclaved to achieve the best finish possible. Rear diffusers can be lacquered to increase protection from UV and increase the parts life span. If you have any questions regarding our rear diffusers or any of our products please feel free to contact us.